T.M. Franklin’s debut novel, More, hit the shelves in early October. When Caleb Foster is assigned to help Ava in her physics classes, her life begins to change. He is handsome, mysterious, and has a mission of his own – which is, of course, not limited to just teaching her physics. More is a fast paced book. A paranormal, young adult, story with mythical sprinkles and lots of mystery. Of course, there is a little romance in between all the action. You can feel it… but can’t see it, until the very end of the book. The advantages of T.M. Franklin’s journalist background can easily be seen on the characters reactions. They are analyzed in depth and feel very realistic. The relationship between Ava and Caleb is developed very slowly. It starts as a friendship, like it would in real-life, which makes it very easy to relate to their struggles and feelings. Tugce: I found MORE interesting; it is a mixture of paranormal, science fiction, and a tiny bit of mythology. What was your inspiration in writing it and involving mythology? Nobody knows exactly who or what the Nephilim were, but this relationship between the “sons of God” and the “daughters of men” was apparently forbidden, and part of what led God to flood the earth. The idea of “heroes of old, men of renown” who would not allowed to be intimate with humans is what led to the concept of The Race and the forbidden Half-Breeds. That was the jumping off point. The rest flowed from there. Tugce: How did you come up with the name MORE? And for Ava and Caleb; can you tell us how you made your characters and name them? Franklin: The title was one of the first things that I came up with once I had the initial concept for the story. The idea was that the Race was – in essence – human, just a little bit MORE. It seemed to fit perfectly. As for Ava and Caleb’s names, I just made a list of names that appealed to me, and finally decided on theirs. Ava’s last name is Michaels, after my husband, Mike. Tugce: You create a fairly different and detailed world in MORE. Which particular chapter or scene was the most difficult to write? Franklin: It’s not a particular scene, but a series of scenes, really – the building up of suspicions in Ava’s mind when it came to Caleb. In the first draft, my editor actually said it seemed like she grew suspicious too quickly, so I had to go back and re-work the first half-dozen chapters. It was a matter of dropping clues, but not letting it be too obvious, so that it seemed logical that Ava would grow to suspect he was not quite what he seemed. So I’d say that was one of the most challenging things. Tugce: MORE is your debut novel, so can you tell us about challenges in getting your first book published? Franklin: It’s been quite a learning process. Editing the manuscript took quite a while, which was both challenging, and also reassuring. My biggest fear was that the book would be distributed and there’d be some horrible mistake in it when it was too late to fix it. It was a constant back and forth between me and my editing team, going over every chapter multiple times. I got so I was sick of reading it! I’m not kidding! It’s hard to hear criticism of your writing. I’m not going to lie about that. But my editing team is so wonderful, and are as committed as I am to making my work the best it can be. So in the end, the process made me feel more confident that the story would be ready when it was finally released. I’d say the biggest challenge has been, and continues to be, getting my book noticed among all of the millions of books on the market. There’s such white noise of authors promoting their books, it’s often difficult to be heard. I’m still feeling my way through that. It’s nice to have a support group of other authors to discuss promotional ideas, as well as my publisher’s marketing department. Tugce: While starting a new story, do you have a goal in mind for your characters before you enter into the story, or is it something you discover along the way? Franklin: I do outline the story pretty thoroughly before I start writing. I find it helps me to stay focused, so that even if I don’t feel particularly inspired, I can keep going. So yes, I definitely have a goal in mind at the beginning. Although the outline may change as I write, the basic plot points usually stay the same. Tugce: The book has a very simple cover, and I know you have designed the cover yourself, so why this image, what made you choose this one? Tugce: There is glimpse to the upcoming sequel at the end of MORE, so I am not asking more about it! Have you been working on anything else since writing MORE? Franklin: In addition to working on the second book in the trilogy, I’ve written a short story called A Piece of Cake, that will be published as part of a Valentine’s Day anthology. I’m also working on another short story, but I can’t really say much about that until mid-November. 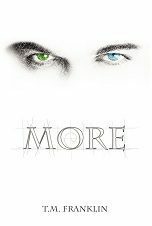 More is rated 4.5 stars out of 5 by readers at Amazon, where it is available in paperback and Kindle versions. It’s also rated 4.5 stars out of 5 at Barnes & Noble, where it’s available in paperback. More is also available for download at iTunes (currently unrated).